On the way to the Lower Chittering Markets, we all spotted a sign with the word “Cheese” on it. 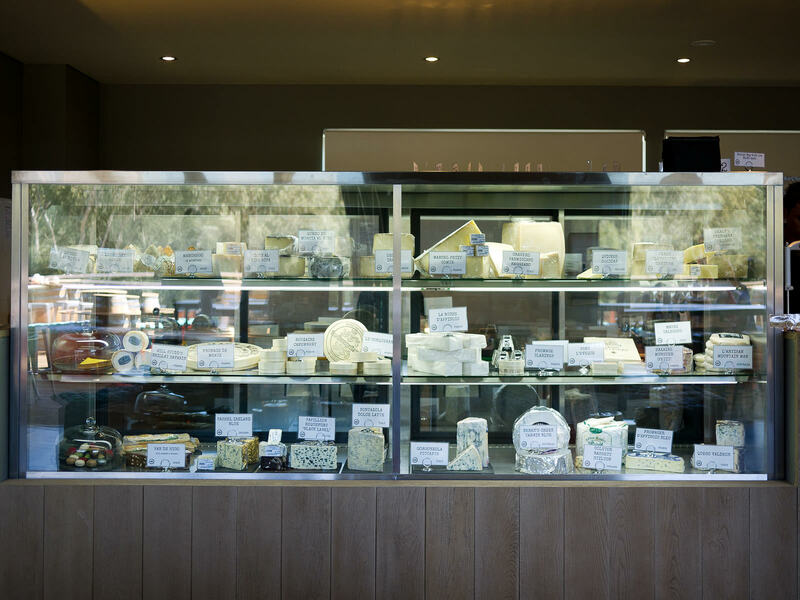 Appealing thoughts of cheese remained with us even as we gobbled market foods, and on our drive home we headed back to that sign, making a detour to The Cheese Barrel, the Swan Valley’s first cheese cafe, opened by Olive Farm Wines in August this year. 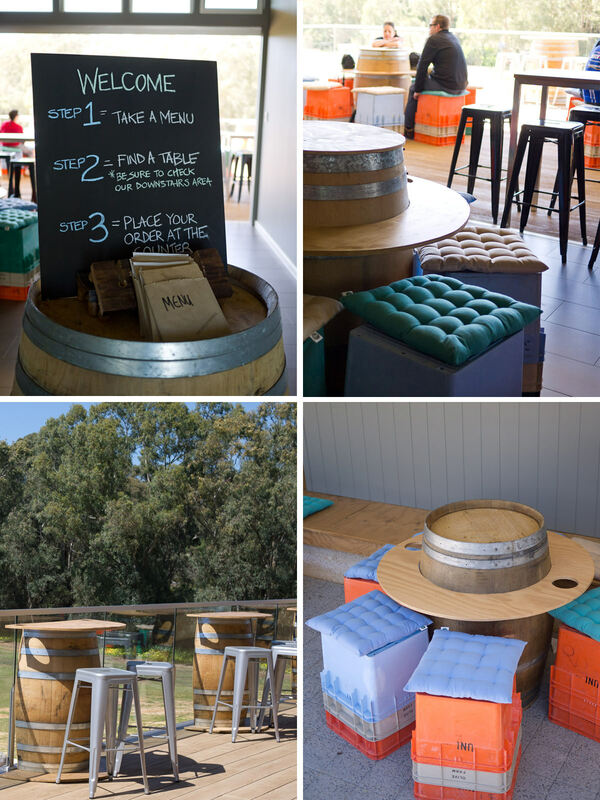 The Cheese Barrel – seating inside and outside (“downstairs”). It’s quite warm out on the deck but that’s what spring in beautiful Western Australia is all about. Appropriately, the tables are made out of old barrels. 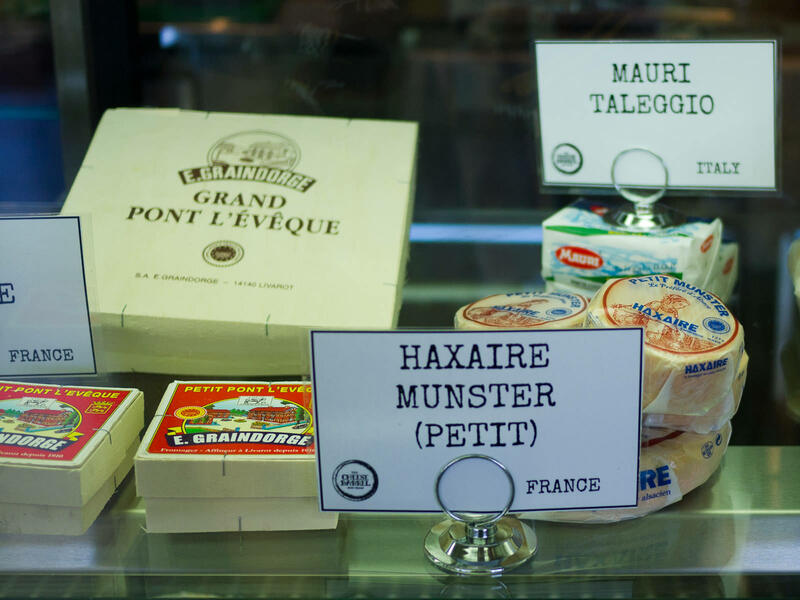 The magnificent cheese display features local and international artisanal, farmhouse and benchmark cheeses – it’s a show-stopping nose print magnet. Even after eating cheese, I was compelled to come back and gaze longingly and lovingly at these cheeses. This is what cheese dreams (and nightmares, perhaps) are made of. 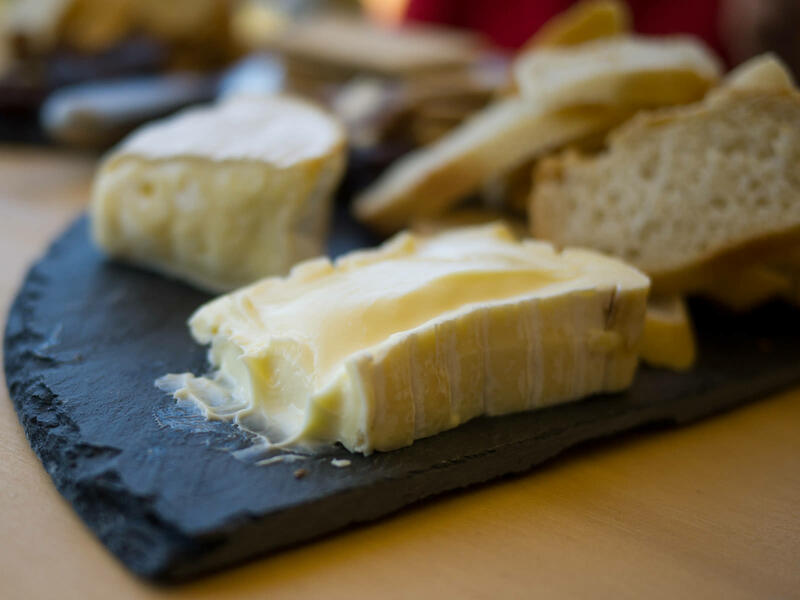 Speaking of cheese dreams and nightmares, have you ever had vivid, maybe even wild and crazy cheese-fuelled dreams after eating lots of cheese the night before? 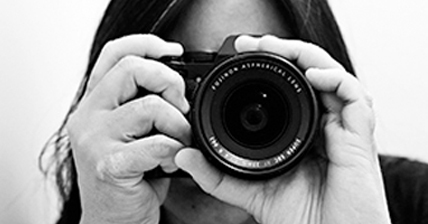 I’d love to hear about your experiences! 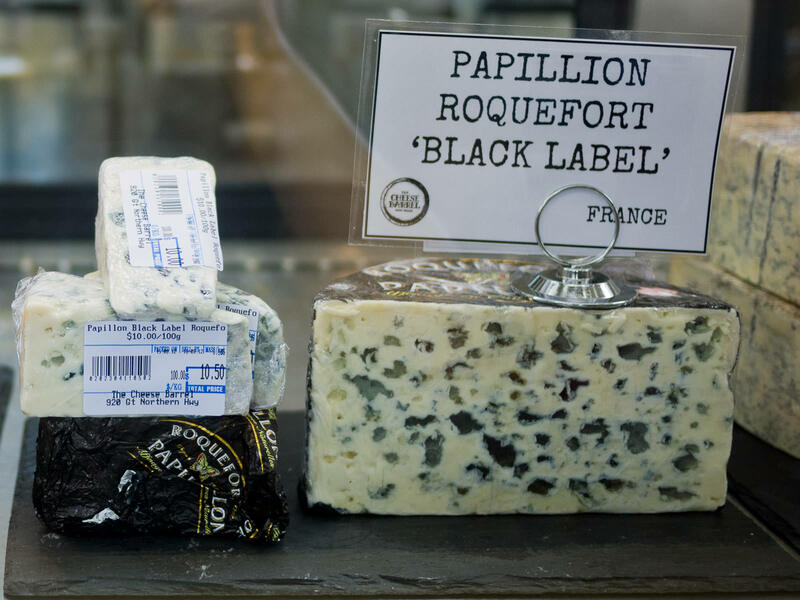 Papillion ‘Black Label’ Roquefort, blue mould ewe’s milk cheese (France). 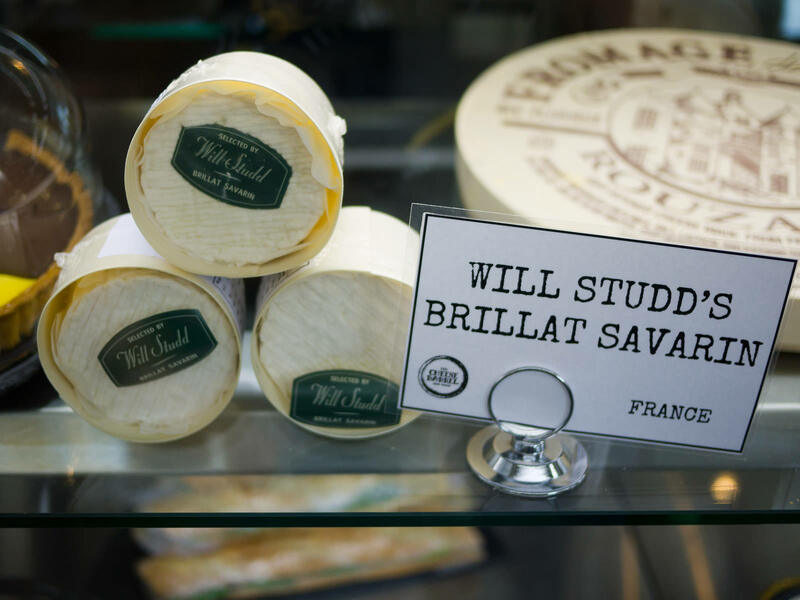 Will Studd’s Brillat Savarin – that’s Will Studd of Cheese Slices fame. I love that show. Jac and I chose the France regional cheese board, which featured Labuche d’Affinois (a soft, creamy buttery white mould cow’s milk cheese); Rouzaire Camembert (another white mould cow’s milk cheese, this one decidedly sockier than the first); Marcel Petite Comte (a quite nutty hard-cooked cow’s milk cheese); and my favourite of the bunch, the speckled Papillon ‘Black Label’ Roquefort (one of the most famous of all blue ewe’s milk cheeses). 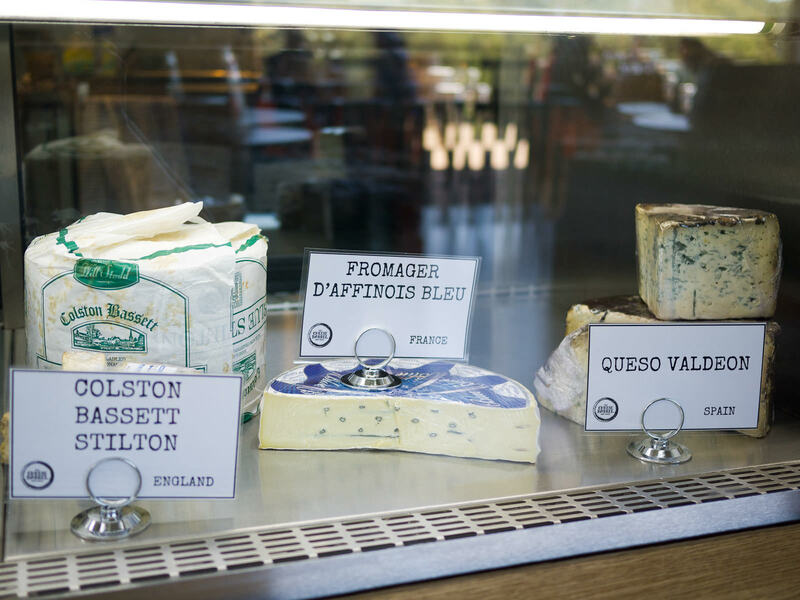 For optimal taste and texture, you should let your cheeses come to room temperature before digging in, as they’ve been kept cool in the display case. 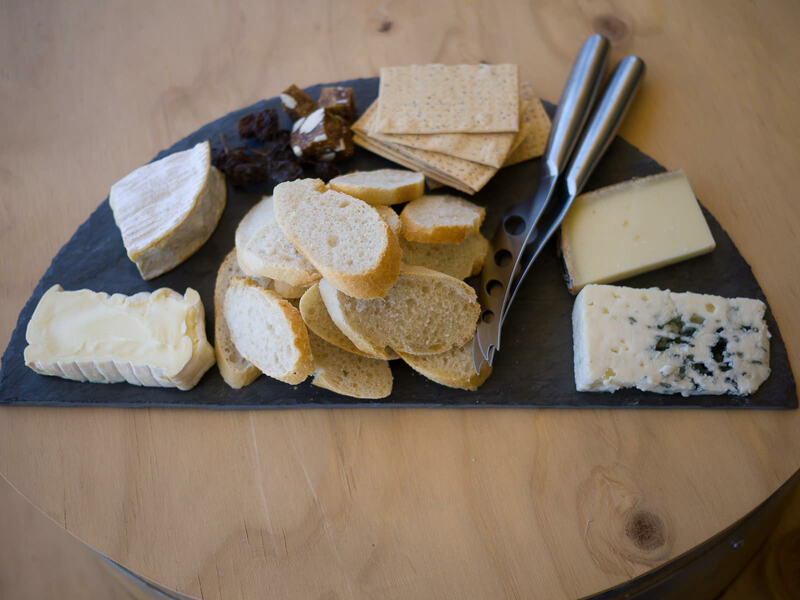 For the greedy (yours truly included), it is excruciating, sitting in impatient anticipation, trying to keep up the conversation and not simply stare at the cheese, or pick at the edges just for a little taste. But it’s well worth the wait – and on a warm day sitting out on the deck, it won’t take long at all. With the regional cheese boards, you can order matching Olive Farm wine tasters for AU$10 per person (AU$8 per person for the Australian cheese wine matches). Jac and I shared one serving of matching wines, which for the French cheeses included: Olivine Brut, Shimmer Sparkling (a fruity, sweet sparkling wine to counter the stinky Camembert), 2007 Malbec and Liqueur Verdelho (a syrupy raisiny dessert wine, a great match for the salty Roquefort). Matching wines for the France regional cheese board. K, her hubby P and her sister R shared the Spain regional cheese board, which featured Queso Garrotxa (a mild-flavoured semi hard cheese made with goat’s milk); 6-month-aged Manchego (the most popular sheep’s milk cheese in Spain); Queso San Simon (one of our favourites, a slowly smoked buttery semi hard cow’s milk cheese); and Queso Valdeon a blue mould cow’s milk cheese, wrapped in brown vine leaves, giving it a look of age and decay that led me to christen it “the zombie cheese”. 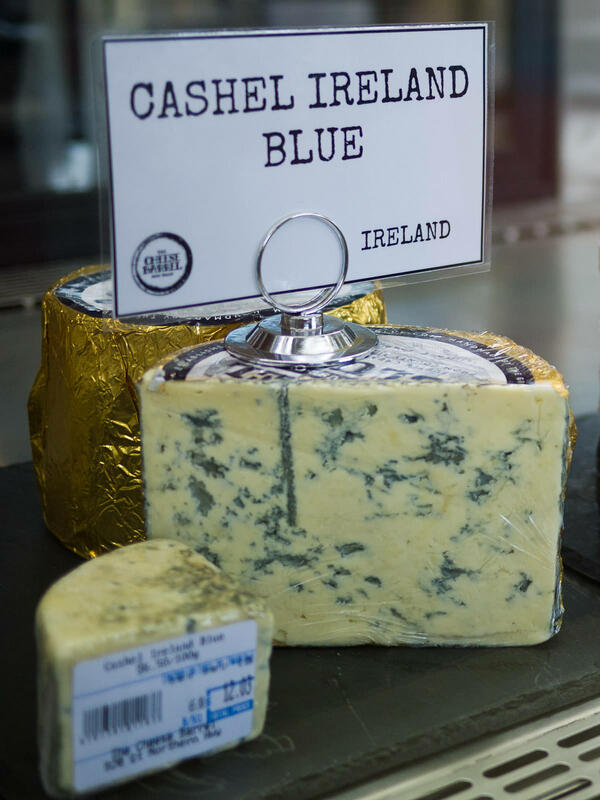 It was intensely salty and strong-smelling, fantastic with the dried muscatels and well worth a taste if you’re partial to blue cheese. We thought the amount of bread and crackers was generously proportioned in relation to the amount of cheese on the platters. The matching wines option was excellent value and most enjoyable. In future when time permits I’d like to attend a cheese making course at The Cheese Barrel, run by The Cheese Maker (see course details). I’d love to learn how to make my own haloumi – that’s on my Food To Do list. 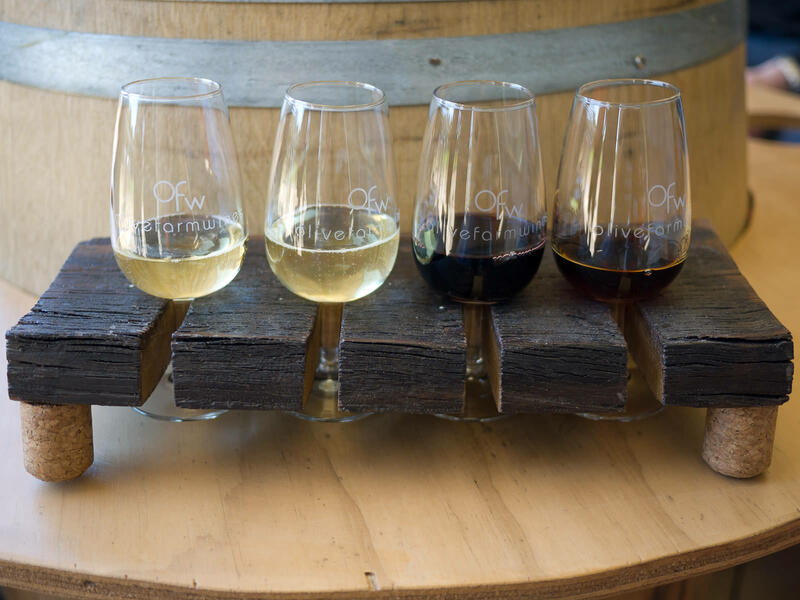 The cafe features Olive Farm wines, locally roasted coffee by 5 Senses and milk by Bannister Downs. If cheese boards don’t appeal (maybe just keep on driving), baguettes with savoury fillings, Parisian pastries and kids’ specials (including a cheese toastie) are also available. I reckon a regional tasting board showcasing Western Australian cheese would be a stunner. 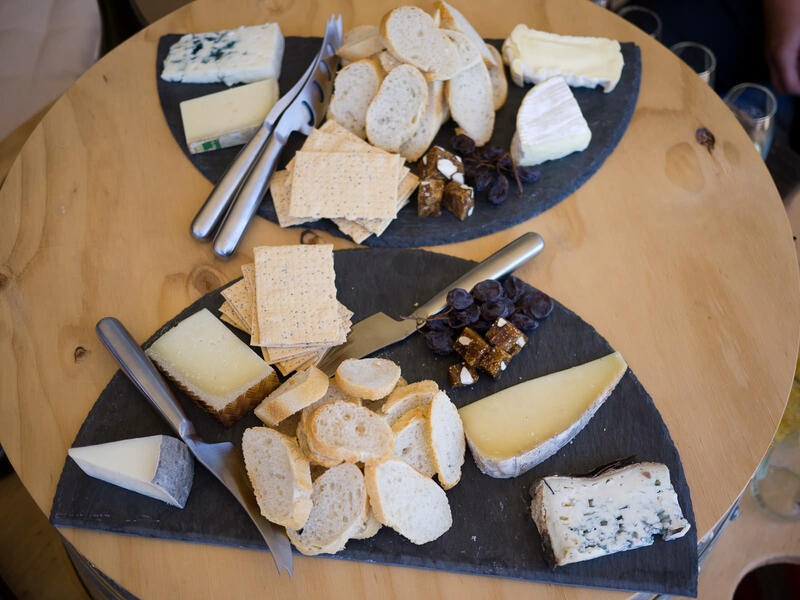 Cheese lovers, it’s best to visit The Cheese Barrel when you have nowhere else to be – so you can savour cheese heaven at a leisurely pace. The Cheese Barrel, Swan Valley. 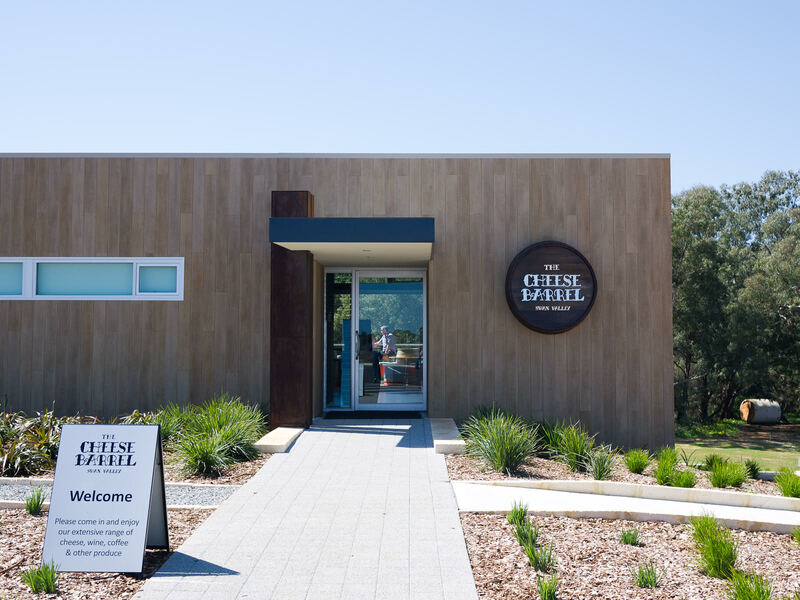 Enter via the Olive Farm Wines entrance – look for the black and white flags. And a sign declaring “Cheese”!